Rabbi in the latter half of the seventeenth century at Amsterdam, where his death occurred about 1693. He translated into Portuguese, from the Hebrew version of Ibn Tibbon, Baḥya's "Ḥobot ha-Lebabot" (Amsterdam, 1670), which gave to this widely circulated work a decided accession of popularity among the Sephardic communities of western Europe. This translation, apart from the language, does not differ greatly from the Judæo-Spanish and Spanish versions existing at the time of its appearance. 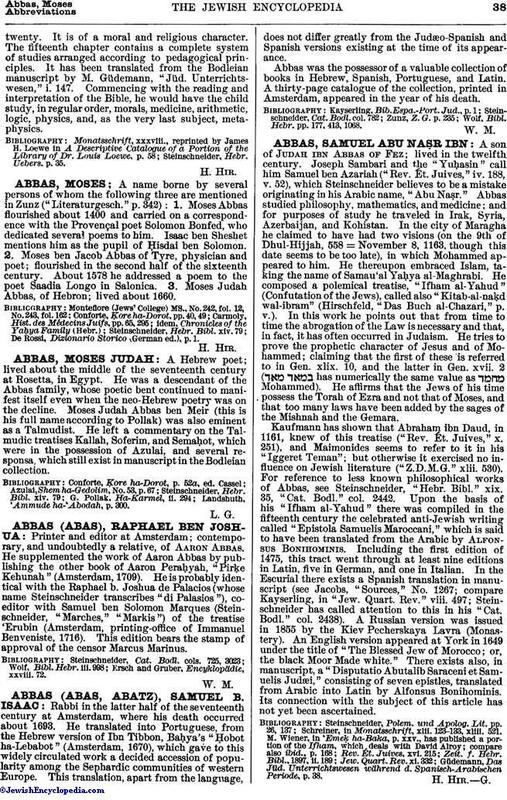 Abbas was the possessor of a valuable collection of books in Hebrew, Spanish, Portuguese, and Latin. A thirty-page catalogue of the collection, printed in Amsterdam, appeared in the year of his death. Wolf, Bibl. Hebr. pp. 177, 413, 1068.